Disclosed is a polyamide fiber having improved dye washfastness and heat stability which consists of a fiber forming polyamide with an additive such as water, an alcohol, an amine and a heat stabilizer such as a phenolic compound or a phosphite containing aryl groups or a mixture thereof. The present invention is directed to nylon fibers with improved dye washfastness and heat stability in particular it is directed to nylon fibers containing an additive such as water, an alcohol, or an amine and a heat stabilizer such as a phenolic compound or a phoshite containing aryl groups or mixtures thereof and a process for the manufacture thereof. Anionic acid dyeing of polyamide yarns involves the reaction of the amino end group of the nylon yarn with the sulfonic acid end group of the dye molecules. Depending on their chemical structure, the anionic dyes could possess a mono-, or a di-, or a tri-sulfonic acid end group. The reactivity of the dye with the fiber is directly proportional to the number of functional groups present in the dye and/or the fiber. Therefore, it follows that the greater the number of dye molecules that bond with the amine endgroups of the fiber, the better the washfastness of the fiber. Several applications involve treatment of heat to the fabric prior to dyeing. A typical example is the case of elastic fabrics which are knitted with elastomeric yarns, e.g. Lycra™ (DuPont, Wilmington) which imparts the stretch to the fabric. Heatsetting of the fabric prior to dyeing is essential to avoid curling of the fabric. Typical heat setting temperatures range between as low as 90°C to very severe temperatures of 200°C. When heat setting is conducted at elevated temperatures such as above 140°C, in air, oxidative degradation of the amino- endgroups occurs destroying the functional groups present in the fiber. This depletion of amino end groups reduces the affinity of the dye molecules to the fiber. Such a fabric picks up less dye than a non-heatset fabric, has a worse wash fastness and has a dull appearance. In more severe cases the preheatset-and-dyed fabrics also exhibit streaky appearance. Therefore, there exists a need to improve the resistance to thermal degradation of polyamide yarns so as to retain the brightness of the fabric, improve the washfastness of the fabric and improve the uniformity of the dyed fabric. To increase dye pick up of a heat set fabric, dyeing methods are modified. This involves increasing the temperature of the dye bath in some cases and/or reducing the pH of the dye bath, in many cases. Although, the modified dyeing procedure increases the affinity of the dye into the fiber, it is a temporary phenomenon, since after dyeing, the fabric is washed thoroughly to remove the acidity in the fabric. The dye molecules that are thus entrapped in the fiber, are loosely bound due to lack of chemically reactive sites in the fiber. Such molecules are susceptible to diffuse out of the fabric during subsequent washings. The physical size of these entrapped dye molecules have a significant influence on the diffusion of the dye out of the fiber and hence, also the dye wash fastness of the fabric. Thus fabrics dyed with smaller dye molecules would exhibit worse washfastness than larger ones. In many cases, the smaller dye molecules are also those which possess a mono-sulfonic acid group, i.e. the least number of functional groups, and hence a lesser affinity to the fiber. Pre-heat set polyamide yarns dyed with such dyes exhibit the worst washfastness. To alleviate this problem, several methods have been invented. Most of these techniques involve a chemical treatment after the dyeing process. DE-A 4,131,926 describes a process wherein the dyed substrates like nylon are treated with dispersions of sterically hindered cycloaliphatic amines, which improves light and washfastness. DE-A 3,330,120 discloses an aftertreatment of polyamide textiles, dyed with anionic dyes, with a polybasic compound which was a reaction product of a polyamine with a cyanamide derivative to improve the wetfastness and washfastness. Yet another method is disclosed in JP 81 53, 293 wherein acid dyed polyamide fibers are treated with a color fixing agent. This color fixing agent is based on a condensation product of a polysulfone, a compound containing amino groups and sulfonic acid groups, and an aldehyde. The washfastness of polyamide fibers treated with this agent is improved. Similarly, JP 80 71,884 describes a polymeric quaternary ammonium compound which when applied to the face of a printed polyamide fabric, improves the colorfastness of the fabric. Although improvements are claimed in washfastness by chemical aftertreatment processes, considerable deficiencies still exist in several applications. These relate to the fundamental issue of reduced affinity of certain dyes with the fiber due to the depletion of amino end groups during preprocessing of the polyamide fabric. A more important issue is that of increased cost of processing the fabric. The chemical aftertreatment not only involves the cost of an additional processing step but also the cost of chemical waste disposal and effluent water treatment. With tighter environment protection regulations on the types of disposable effluents, the economics of aftertreatments could get to be restrictive. Therefore, there exists a need for polyamide fibers that would possess better washfastness of polyamide yarns without increasing or altering the chemicals that are used currently in the dyebath and a process for the manufacture thereof. Furthermore, there also exists a need to achieve a better exhaustion of the dyebath so as to reduce the dyes and chemicals being released as effluents in the waste water. U.S. Pat. No. 4,863,664 discloses a high speed process of making polyamide filaments by melt mixing polyamide with some additives like water, alcohols or organic acids prior to spinning. Although, the process claims to improve yarn quality, processability and dye washfastness of the fabric, it does not address the issue of heat stability of the fibers made from such a process. The poor heat stability and the resulting streaky dyeing are significant disadvantages of this process. It was the object of the present invention to reduce or eliminate the deficiencies existing in current polyamide fibers and processes in relation to washfastness and heat stability of the fabric and provide polyamide fibers with improved dye washfastness and heat stability and a process for the manufacture thereof as well. Still another object was to provide polyamide fibers for the manufacture of yarns which would possess reduced yellowing and retain the whiteness of the fabric after heat treatment and a process for the manufacture of such yarns. Another object was to provide polyamide fibers for the production of dyed fabrics having improved uniformity after heatsetting and a process for the manufacture of such polyamide fibers. Another object was to provide polyamide fibers which achieve a greater exhaustion of the dye bath at an increased rate thereby reducing the release of effluents of waste dyes and chemicals in waste water and a process thereof. Yet another object was to provide polyamide fibers for the production of dyed fabrics having deeper dye shades and a process for the manufacture of such polyamide fibers. Since swimwear is one of the potential applications for the yarns of the present invention where resistance to fading in a chlorinated water pool is a major requirement, it was another object of the present invention to provide polyamide fibers which would possess improved resistance to color fading in a chlorinated water pool and a process for the manufacture of such polyamide fibers as well. (c) a heat stabilizer selected from the group consisting of phenolic compounds, phosphites containing aryl groups and mixtures thereof. Fiber forming polyamides (a) are well known by the generic term "nylon" and are long chain synthetic polymers containing amide (-CO-NH-) linkages along the main polymer chain. Suitable fiber-forming or melt spinnable polyamides of interest for this invention include those which are obtained by the polymerization of a lactam or an amino acid, or those polymers formed by the condensation of a diamine and a dicarboxylic acid. Typical polyamides include nylon 6, nylon 6/6, nylon 6/9, nylon 6/10, nylon 6/12, nylon 6T, nylon 11, nylon 12 and copolymers therof or mixtures thereof. Polyamides can also be copolymers of nylon 6 or nylon 6/6 and a nylon salt obtained by reacting a dicarboxylic acid component such as terephthalic acid, isophthalic acid, adipic acid or sebacic acid with a diamine such as hexamethylene diamine, meta-xylene diamine, or 1,4-bisaminomethyl cyclohexane. Preferred are poly- epsilon-caprolactam (nylon 6) and adipic acid or sebacic acid with a diamine such as hexamethylene diamine, meta-xylene diamine, or 1,4-bisaminomethyl cyclohexane. Preferred are poly-epsilon-caprolactam (nylon 6) and polyhexamethylene adipamide (nylon 6/6). Most preferred is nylon 6. Suitable additives (b) are water, mono- and polyalcohols, mono- and diamines and mixtures thereof. Suitable monoalkahols are C₂ - to C₁₈ - alkohols like ethanol, propanol, butanol, hexanol, decanol, undecanol, octadecanol; arylsubsituted alcohols like benzyl alcohol and benzoin. Suitable polyalcohols are glycols like ethylene glycol, diethylene glycol, triethylene glycol, propylene glycol, dipropylene glycol, neopentylglycol, glycerin, trimethylolethan, trimethylolpropan and pentaerythritol. Suitable amines for the additive (b) are mono- and diamines, preferred are diamines like hexamethylene diamine, meta-xylene diamine and 1,4 bis-aminomethyl cylohexane. The preferred additive (b) is triethylene glycol and hexamethylenediamine. The additive (b) is usually used in an amount of from 0.05 to 5% by weight, preferably from 1 to 4% by weight, most preferably from 1.5 to 3% by weight, based on the total amount of the polyamide fiber. Suitable heat stabilizers (c) are phenolic compounds, phosphites containing aryl groups and mixtures thereof. Suitable phenolic compounds are compounds which contain at least one phenolic group with two lower alkyl substitutents in the aromatic ring, at least one of which is in ortho position of the hydroxyl group. The lower alkyl groups are preferably branched groups such as t-butyl. Examples for alkyl substituted phenolic groups are 3-t-butyl-6-methyl-4-hydroxy phenyl and 3,5-dimethyl-4-hydroxyphenyl. Examples for phenolic compounds are disclosed in U.S. Pat. No. 4,187,212, the disclosure thereof is herewith incorporated by reference. Preferred are phenolic compounds such as 2,2'-methylene-bis(6-tert.-butyl-4-methylphenol), 2,2'-methylene-bis(6-tert.-butyl-4-ethylphenol), 2,2-bis(3,5-di-tert.butyl-4-hydroxyphenyl)-propane, 1,3,5-tris-(3,5-di-tert.-butyl-4-hydroxphenyl-propionyl)-hexahydro-s-triazine, N,N'-di(3,5-di-tert.-butyl-4-hydroxyphenyl-propionyl)-hexamethylenediamine, 1,3,5-tri(3,5-di-tert.-butyl-4-hydroxybenzyl)-2,4,6-trimethylbenzene, pentaerythritol-tetra-[3-(3,5-di-tert.-butyl-4-hydroxy-phenyl)-propionate], β-(3,5-di-tert.-butyl-4-hydroxyphenyl)-propionic acid-n-octadecyl ester, thiodiethylene glycol- β-[4-hydroxy-3,5-di-tert.-butyl-phenyl]propionate, 2,6-di-tert.-butyl-4-methyl-phenol, and 3.9-bis[1,1-dimethyl-2-(3,5-ditert.-butyl-4-hydroxy-phenyl)-ethyl]-2,4,8,10-tetraoxaspiro-[5,5]-undecane. U.S. Pat. Nos. 3,584,047 and 3,677,965 disclose polyamides containing these alkyl substituted phenolic groups, more specifically polyamides derived from alkylhydroxyphenylalkanoic acids and polyamines. These compounds are particularly suitable for the present invention and the disclosures of these patents are herewith incorporated by reference. Suitable phosphites containing aryl groups are disclosed for example in U.S. Pat No. 4,187,212, the disclosure thereof is herewith incorporated by reference. Particularly useful are mixtures of phenolic compounds with phosphites. The heat stabilizer (c) is usually used in an amount of from 0.01 to 3% by weight, preferably from 0.1 to 1.5% by weight, most preferably from 0.15 to 1.25% by weight, based on the total weight of the polyamide fiber. whereby, optionally, a drawing step can be before or after step (V), and whereby, optionally, a texturing step may be added after drawing. In another preferred embodiment the draw ratio usually is from 1.0 to 4.0, most preferred from 1.0 to 3.0. In one process the heat stabilizers (c) may be added before or during the polymerization of the polyamide and the additive (b) may be added before or during processing of the polyamide into a fiber. In another preferred embodiment, both the heat stabilizers (c) and the additives (b) may be added simultaneously or separately before or during polymerization of the polyamide and the mixture may be processed into a fiber in the next step. Alternatively, the heat stabilizers (c) and additives (b) may be mixed together homogeneously and added to the polyamide during its processing in the form of fibers. The addition of the heat stabilizers (c) and additives (b) to the polyamide during processing of the fibers could be performed in several ways. In one case, the components (b) and (c) may be volumetrically or gravimetrically fed individully or as a mixture to the extruder using a suitable feeding system eg. Colotronics® system (Colotronics Inc.) or K-tron® gravimetric feeder (K-tron, Switzerland). In another case, the components (b) and (c) may be mixed homogeneously in a suitable non-reactive inert liquid and the mixture may be injected in the extruder to achieve a melt mixing with the polyamide. Alternatively, if one or both of the components are in a liquid form, the mixture could be injected directly into the extruder without dispersing it into the inert liquid. In another method the mixture of the two components (b) and (c) may be melted and the melt may be injected into the extruder using a liquid injection system. Additionally, another preferred embodiment to process the polyamide fibers of the present invention would be by preparing a concentrated master-batch of polyamide chips containing high levels of one or both components (b) and (c) and mixing that master-batch with the polyamide polymer to achieve the desired levels of the components in the fiber. The mixing of the two polymers, namely, the masterbatch chips and the polyamide chips could be done using a volumetric or a gravimetric feeding system at the opening of the extruder or could be done using a side-arm on the main extruder wherein the molten streams of the two polymers may be mixed. The homogeniety in the two streams could be achieved using in-line static mixers. The melt mixing may be performed in an extruder at a temperature of 20° to 40°C above the melting temperature of the polyamide being used. The additive (b) and the heat stabilizer (c) may be added together or separately to the polymer chips or grannules before they enter the extruder, or may be added into the opening of the extruder together with the polyamide or may be added through a side extruder directly into the melt, where the mixing to a homogeneous mixture takes place. 3) a one step high speed spinning process without drawing the yarn, at a speed of at least 3000 m/min, preferably with at least 3500 m/min. An optional step is texturizing the fibers with, for example, and air jet, gear crimping, stuffer box, or edge crimping process. In several cases, drawing and texturizing could also be performed in a single step, such as in case of a one step bulked continuous filament (BCF) yarn process for carpet enduse. The textured yarn produced on such a process is taken up to be wound on a package. The fibers of the present invention usually have deniers (denier = weight in grams of a single filament with a length of 9000 meters) in the range of 0.5 to 20.0 denier/filament (dpf). A preferred range is from 0.7 to 3.0 dpf. The fibers of the present invention usually have an amine end group (AEG) content of from 15 to 70 meq/kg, preferably from 35 to 50 meq/kg, and a relative viscosity (RV) (measured in formic acid at 25°C, but given values are calculated values corresponding to a measurement in sulfuric acid at a concentration of 1 g of fiber per 100 ml in 96% strength by weight sulfuric acid at a temperature of 25°C) of from 2.0 to 3.2, preferably from 2.2 to 3.0. In a preferred embodiment the polyamide fibers of the invention on hand are having an improved heat stability measured in a spectrophotomatic yellowing value Δb of less than about eight (8) after two minutes exposure to 380°F (193°C). In another preferred embodiment the polyamide fibers of the invention on hand are having a dye uptake with a dye saturation value of at least 3% based on weight of fabric. In another preferred embodiment the polyamide fibers of the invention on hand are having an improved dye washfastness measured by the cigar bleed test stain rating of at least 3.5 on color matched samples. In another preferred embodiment the polyamide fibers of the invention on hand are having a tenacity of from 2 to 5.5 g/den and an elongation of from 25 to 75%. The combined effect of the heat stabilizer (c) and the increased AEG of the polymer resulting from the additive (b), results in an enhanced dyeability, improved wash fastness, better heat stability. An additional advantage also results from the reduction in the starting concentration of dye bath to achieve shades similar to that of a control yarn. Alternatively, deeper shades which cannot be achieved with a control yarn are possible with this invention. Other advantages become apparent from the following examples. Nylon 6 (Ultramid® BS 700F, BASF Corporation, Freeport, TX) was extruded at a temperature of 272°C through a 12 hole round cross section spinneret of hole diameter 200 microns and capillary length of 400 microns. Triethylene glycol (TEG) was injected at the throat of the extruder during spinning by means of a Zenith metering pump at different levels. The filaments were cooled in a quench cabinet where air at 55° F (12.8°C) and 65% relative humidity was blown at 100 ft/min (30.5 m/min). The filaments passed through a tangling jet and were taken up by a set of godets running at 5000 m/min. The yarn then went through a steam chamber where steam at a temperature of 130°C was maintained at a pressure of 65 psi (448 kPa). The yarn was wound on a Barmag SW-6 winder at a speed of 5390 m/min. The morphological properties of the fibers are listed in Table II. The density of fibers was measured using a Quantachrome® Helium pycnometry. No correction was made for additive volumes. A typical high speed spun polyamide fiber exhibits two types of crystal structures, namely, alpha and gamma. The percent composition of each of the crystal types present can be obtained using Wide Angle X-ray Diffraction (WAXD) techniques. A theta-two theta equatorial WAXD scan of nylon 6 can be resolved into 5 peaks, 4 of which are assigned as crystalline peaks, namely, α₂₀₀, γ₀₀₁, γ₂₀₀ and σ₀₀₂. The relative fractions of alpha and gamma crystals can be obtained from ratios of the integrated intensities of the resolved peaks. Equatorial ϑ-2ϑ difractometer scans were obtained on a Siemens D500 x-ray generator with a Cu-Kα radiation generated at 40 kV and 25 mA. The five-line model developed by Heuvel and Huismann (H. M. Heuvel and R. Huismann, J. Appl. Polym. Sci., Polym. Phys. Ed., 19, 121 (1981)) was used to resolve peaks and obtain the α/γ ratios. Density of pure alpha phase is taken as 1.23 gm/cm³ and that of pure gamma phase is assumed to be 1.21 gm/cm³). "Polymer Handbook," Ed. J. Brandup and E. H. Immergut, Publ. J. Wiley and Sons, N.Y. (1989)]. Mechanical properties of the fiber were measured using the Statimat tensile tester at a rate of extension of 24 cm/min and a gage length of 20 cm. To determine the boiling water shrinkage (BWS), lengths of skeins (l º) of 90 m of yarn were measured at a pretension of 0.056 gm/den and were allowed to shrink freely in a boiling water bath for 1 min. The length of skeins (l) were remeasured at the same pretension and the percent shrinkage was calculated based on dl/l º, where dl is the change in length of the sample, (l º - l). Relative viscosity of yarns were measured by a single point method. Flow times of solutions (ts) of 1% by weight yarns in formic acid were measured using a Ubelhode viscometer and were compared to those of pure solvent (to). 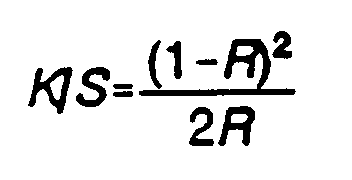 The relative viscosity (RV) was calculated as ts/to. The RVs thus obtained were converted to those that would have been obtained using sulfuric acid as solvent using a, calibration curve. The amino end group (AEG) concentration was obtained by standard potentiometric titration method. A 3.33% by weight (b.w.) solution of dry polymer or yarn was prepared in 68% b.w. phenol/32% b.w. methanol and titrated against 0.02 N hydrochloric acid to a predetermined pH. The AEG was calculated from a calibration curve obtained using polymar chips of known AEGs. The yarns were knitted into fabrics and dyed using the following procedure. The greige fabrics were preheatset at 193° C for 60 seconds. A dye bath with a liquor ratio of 15:1 was prepared which contained 1% owf Irgalev PBF, 2% owf Ammonium sulfate and 2% owf Acetic acid of a concentration of 56%. Critical commercial swimwear shades were used to test these samples. Dyeing was carried out at 96°C for one hour. After dyeing the samples were rinsed and treated in a bath of 1.0% b.w. acetic acid (28%), 3% b.w. tannic acid and 4.0% b.w. fixing agent XP-10 (Piedmont Chemical Industries, Inc.) for 30 minutes. These aftertreated samples were rinsed in a bath of 0.5% b.w. Peregal ST with a liquor ratio of 40:1 at 60°C for 10 minutes. The rinsed samples were later dried and tested for washfastness. A negative ΔL* value indicates darker shade as compared to the control. Clearly, example 8 exhibits a much higher rate of dyeing as well as a greater dye uptake. In another experiment, examples 7 and 8 were dyed to saturation and the residual equilibrium dyebath concentration was measured in each case. The amount of dye on the fabric was calculated after normalizing for weights of the samples in the baths. (c) a heat stabilizer selected from the group of phenolic compounds, phosphites containing aryl groups and mixtures thereof. (e) winding the polyamide fibers.